Mordian 7th Regiment: Necromunda - Eschers and others on display! Managed to get my mitts on the new Necromunda on Friday and couldn't help but dive right in! After a good day of gluing my fingers together and a fair chunk of brush time the newest iteration of the Eschers were ready for their close up, and some old faces got taken off the shelves for a bit of fresh air! The Militia of Eth Ridge (har!) is the first time I've actually done any Eschers - When we played years ago several other of the group played them so I never gave 'em a try. The new plastic set is really fantastic and I rather enjoyed building them, fiddly as they may be! Stuck fairly close to the 'default' paint scheme on them, and tried my hand at some zebra stripes and leopard spots here and there. The front 90 degree facing is important in the new Necromunda, so I marked out the bases in white, though in retrospect I think I'm going to turn it into black and yellow hazard stripes. While I was putting the models into a tray to run down to the GW shop, I figured I ought to dig out what Necromuna models remained in the depths of the Closet of Doom, and uncovered my House gang of choice - House Delaque. The Cobalt Snakes were never a particularly effective gang, but over time there sure were a lot of 'em! Really interested to see what the new iteration of their models will look like! My other favored gang from back in the day was Hunt Team Phi Sigma Rho, a group of Spyrers comprising one each of Orrus, Malcador, Yeld and Jakara. I'm really hoping that GW will continue on beyond the 'original six' and delve into the models and rules from the Outlanders supplement, including the Spyre Hunters, Ratskins, Scavvies and of course The Redemption! 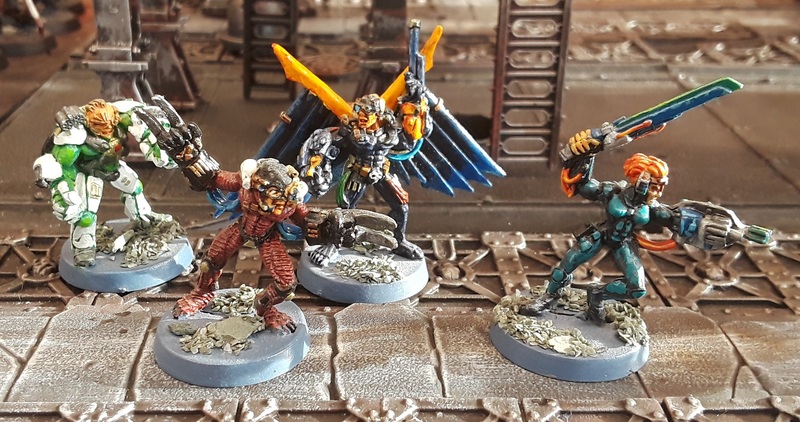 I held on to a couple special characters and follow-on gangs from the Outlanders book and Necromunda magazines, including Bull Gorg, pit fighter extrordinairre, and Kal Jerico the most badass bounty hunter in the Underhive. ...At least that what he'll tell ya! 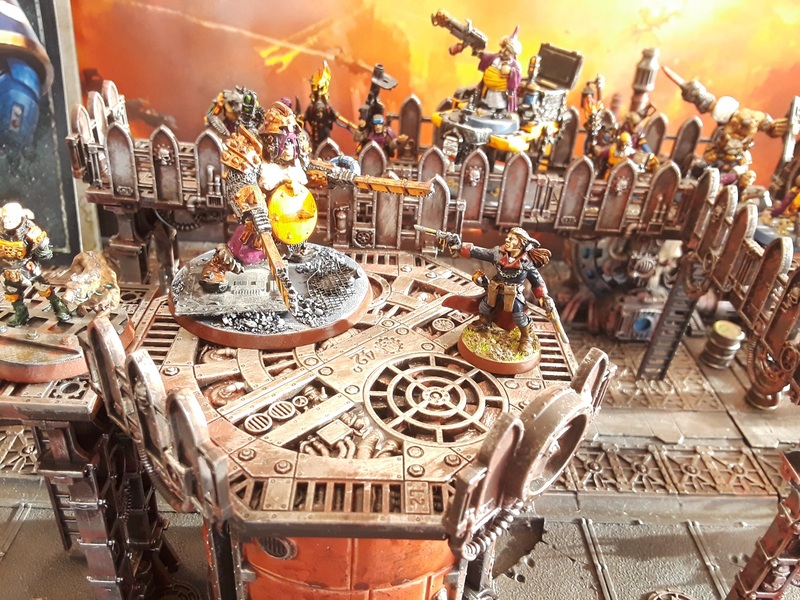 Rather pleased with how this particular pic turned out, with the inestimable Jerico menaced by the beast while the guilder and his cronies look on and jeer from the stands! Speaking of, one of my very favorite 'gangs' were the guilders, with my particular band led by the portly-but-surprisingly-dangerous Count DeMonay and his pack of henchmen, cronies, bodyguards and hired guns. I initially didn't hold out much hope that we'll see the Guilders, but they're mentioned in surprising detail right in the main rulebook alongside the house gangs, so perhaps Count DeMonay may see the table again earlier than expected! Last but not least, the Arbites of Precinct 13 ("Unlucky for some"). I really hope we'll see these guys walking the beat again at some point in the future as well. With as well done as the new Escher and Goliath (and as of today Orlock) models have been I am super jazzed to see what else they come out with! Got a chance to play the basic game yesterday (to come to grips with the main rules before adding on all the Gang War campaign expansion stuff) and I gotta say I REALLY enjoyed it. The lineage of the 1st edition game shines through, with a few tweaks to the old rules and a few new additions that all added to the experience in.my opinion. I really dig the small update to the flesh wound/serious injury method and the bottling out process, and the gangs definitely feel more differentiated from the outset than they did in 1st edition. Used to be it was really only after a few games that your gangs started for show their house flavor. The tactics cards added a nice extra bit of spice without being overpowered (at least the ones we drew), and while I was initially down on the ZM tiles (I much prefer the 3d terrain of old) it was actually rather fun to rumble in the tunnels for our learner games. I will say that to me the Eschers were definitely the standouts of the two. Far more customizable than the Goliaths, though I understand why that's the case - with all the exposed musculature they had to make the arms fit on the Goliaths in a very specific way to look good. I found it amusing as well that the Goliaths are actually showing more skin than the Eschers, and am rather happy that the girls aren't hyper-sexualized. They are feminine without being cheesecake which to me is quite welcome. 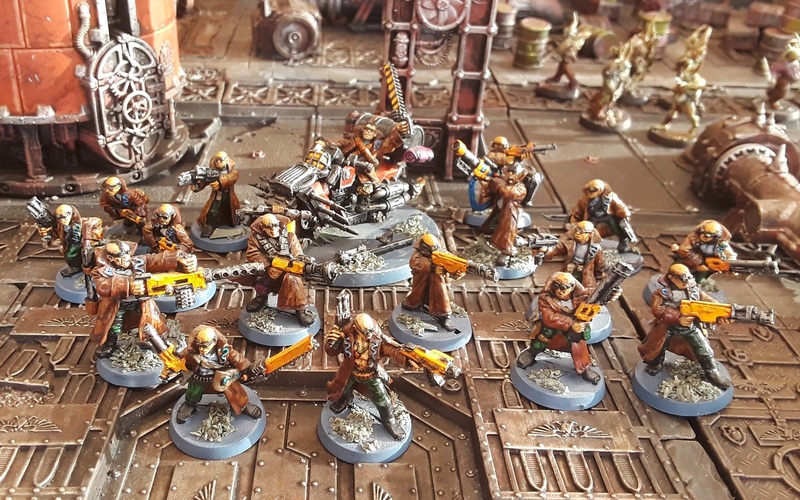 As of now I'm giving it a 9/10 - nostalgia filters in place for me of course as Necromunda was always my favorite specialist game, and I'm appy to report that my fears that they would mess it up were unfounded. This is more or less exactly what I hoped the reboot would be, a loving adaptation of the old system and not a complete rewrite from the ground up. Good stuff! So good to read a review from someone whos opinion i trust be a positive one. Your Eschers sure look great, especially like how you’ve incorporated the blue. Great idea with marking the facing. Good to see your old gangs on display too. Fast paining if there was any! For the 90º I would divide the base into four quadrants using stripes. I can't play until my beloved crusaders have rules, and since they drop a gang a month that can take quite some time :/. Hahaha. holy crap you almost done already and mine is still being delivered. Personally I'm waiting for Van Saar to arrive, but the Arbites are a close second. I'm glad Necromunda is back and is showing itself to be good, as this fills me with hope should they ever re-release BFG or Epic. I thought you were just going to use the white area as a spot for their names at first. Hazard stripes would work well, too, tho. The Militia of Eth Ridge...LOVE IT!!!! Are the new minis the same size/scale as the old ones? 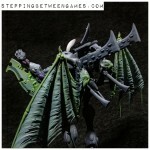 FOr some reason they just look bigger to me that then older sculpts, though that could just be a result of photography. Gonna find some gangs tomorrow night. #inspired. I am not even a little surprised that they are one (day) and done!! @Dai: I'm really digging it - Definitely worth picking over ebay for the rulebook, seems like they're starting to show up there for reasonably cheap! @Dave Henderson: Thanks very much! @Siph_Horridus: Really looking forward to seeing yours! The eschers were pretty fiddly to assemble, but look great! @Steven Burden: Nice! I was always a Delaque guy myself, looks like we're both in for a wait for 'em! @Da Masta Cheef: Haha! The Eschers are about the same size and on 25mm bases, though the Goliaths are significantly bigger than they used to be and stand on 32mm bases. Sounds like the rest of the gangs will be on 25's for the most part. @Zzzzzz: It's really fired me up to rework my old gangs! @Riot: Haha! They were a blast to both build and paint so they just flew by! Thanks for all the kind words, everyone!